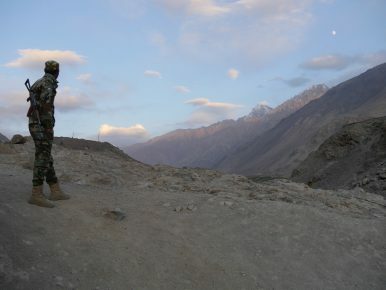 A Tajik border guard looking out over the Afghan mountains. Impoverished and oppressed, Central Asian migrants to Russia make perfect targets for extremist recruiters. According to a report by the Crisis Group in January 2015, between 2,000 and 4,000 Central Asians had joined Islamic State (ISIS). An unknown number were recruited during their stay as labor migrants in Russia. Caught between lack of prospects and suppression in the home country and discrimination and harsh living conditions in Russia, the promise of a good life in the caliphate is attractive. 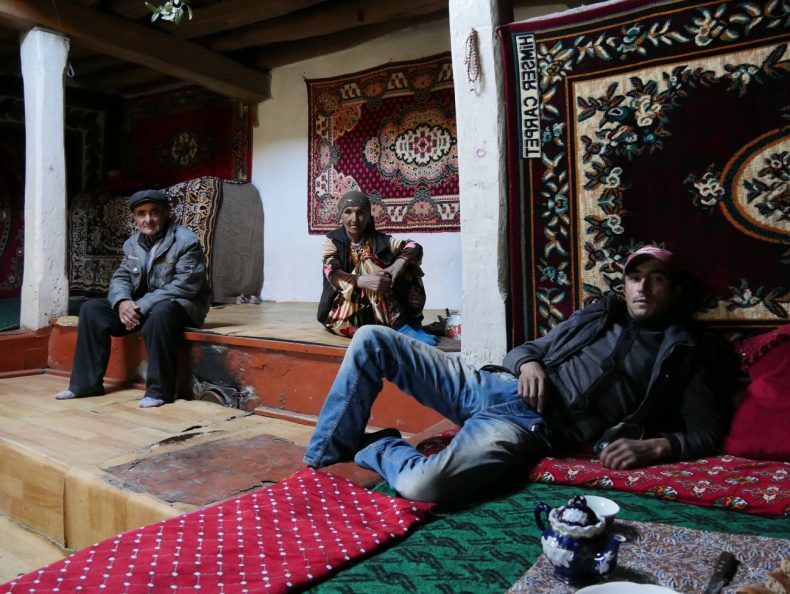 Chorqisloq, Tajikistan — A remote town home to 69 villagers, including women and children, who have left for Syria. Image by Iris Oppelaar. According to the imam of the local mosque, recruiters stand no chance in Tajikistan because of strict government control. Most residents are instead recruited to join ISIS during their stay in Russia, where they work and live with fellow villagers. With an estimated 500 to 1,100 Tajiks joining Islamic State in Syria, the Tajik government is strongly committed to the fight against radical Islam. The government’s approach is characterized by severe pressure on freedom of religion and the elimination of political opponents by labeling them as terrorists. In 2015, the Islamic Renaissance Party of Tajikistan (IRPT), the only opposition to the ruling President Emomali Rahmon, was banned and declared a terrorist group. The majority of IRPT’s members were detained. Over the last few years, the government introduced an informal ban on beards. Children under 18 are refused access to mosques and the majority of the Islamic schools are closed. To make the sacred journey to Mecca, one must be at least 45 years old and official permission from the government is required. These measures restrict freedom of religion, but more important, create an atmosphere of fear among the general public. Friday prayers at the Cathedral Mosque in Moscow, Russia. Image by Iris Oppelaar. Kyrgyzstan – which likes to see itself as an island of democracy because of its political contrast with the dictatorships of Turkmenistan, Tajikistan, and Uzbekistan – has a different approach in the fight against radical Islam. By working with local non-profit organizations, the government is trying to get a grip on what is taught in the madrassas (Islamic schools). With a curriculum only consisting of Islamic subjects, the diploma is perceived to be useless by many. A local NGO provides the students of madrassas with mathematics, computer, and cooking lessons. “Unable to find a job because of lack of proper education, former madrassa students are more prone to radicalize. We want the students to realize there is more in life than just Islam,” says an employee of a local non-profit organization. In the Osh region in southern Kyrgyzstan, hundred inhabitants have left for Syria, according to the head of the local police. 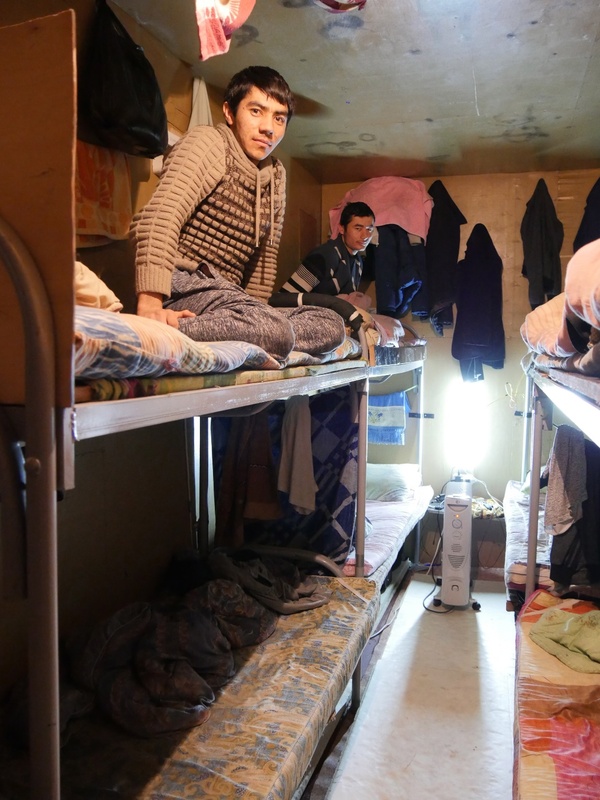 Ten of them are known to have died in Syria; a handful are imprisoned in the city of Osh. “2013 and 2014 were the peak years. Less people go to Syria nowadays because they understand there is no jihad there,” the police chief says. Although the peak days for joining jihad in Syria may be over, in the southern city of Batken, family members of a missing migrant worker are wondering whether he left for Syria. “The last time we spoke to him, he asked for a photo of his children. His phone is turned off for months, we don’t know where he is or whether he is still alive. For all we know he left to Syria,” says Bakhar, who is visibly concerned about the welfare of his son-in-law. In Kyrgyzstan, the family members of a missing labor migrant. Image by Iris Oppelaar. Twenty-five years after independence, the former Soviet republics of Kyrgyzstan and Tajikistan are still largely dependent on Russia. Every year, thousands of labor migrants from Central Asia make their way to Russia, in search of a better future. Reasons to migrate are purely economic in nature for many migrants, although underlying social and political factors should not be underestimated. Tajikistan, with only 6 percent arable land and minimal industry, is the poorest of the five Central Asian countries. With jobs scarce, Tajikistan is heavily dependent on migration to Russia. In 2015, money being earned and sent home by migrant workers in Russia accounted for 28 percent of Tajikistan’s Gross Domestic Product (GDP). Divided from Afghanistan by the Panj river, Tajikistan is the first stop on the trafficking route for heroin to make its way to Russia and Europe, providing one of the few alternatives to migration for those seeking to make a living. Alek and his family live in a small village along the 1,300 km long Tajik-Afghan border. From the roof of his house, Alek can look out over the Afghan mountains. He wants nothing to do with the heroin trade. “The risk is too big. Two of my acquaintances were caught trafficking heroin and are now serving eight years in prison,” he says. In the spring, Alek will go to Russia for a few months in hopes of earning some money for his family. Pamir mountains, Tajikistan — Alek and his parents in their traditional Pamiri house. With no jobs and only the heroin trade and addiction to turn to, Alek will go to Russia in spring. Image by Iris Oppelaar. Besides the obvious economic reasons to migrate to Russia, discontent about corruption and political and religious suppression cannot be neglected as factors in the massive migration flow. As 24-year-old Korotulbai, a law graduate from a small town in the south of Kyrgyzstan, explains: “I cannot imagine a future in Kyrgyzstan. I was studying hard. Other students got better results because they paid for it.” Korotulbai now works at a fast food chain in Moscow. His wish for the future is to build up a life in Russia, together with his wife and son. Discontent about corruption and lack of perspectives drives much-needed specialists like doctors, teachers, and lawyers to Russia, in search of a better future. Villages with only the elderly and children are common in remote areas in Kyrgyzstan, with an estimated 25 percent of the total population working in Russia. With freedom of religion at stake and a lack of prospects in their home countries, Russia seems to offer opportunities in both the economic and religious spheres. Upon the migrants’ arrival in Russia, this often turns out to be an illusion. Moscow, Russia – a village of containers on the outskirts of Moscow. A container is often the home of up to eight labor migrants from Tajikistan, Kyrgyzstan, or Uzbekistan. Image by Iris Oppelaar. 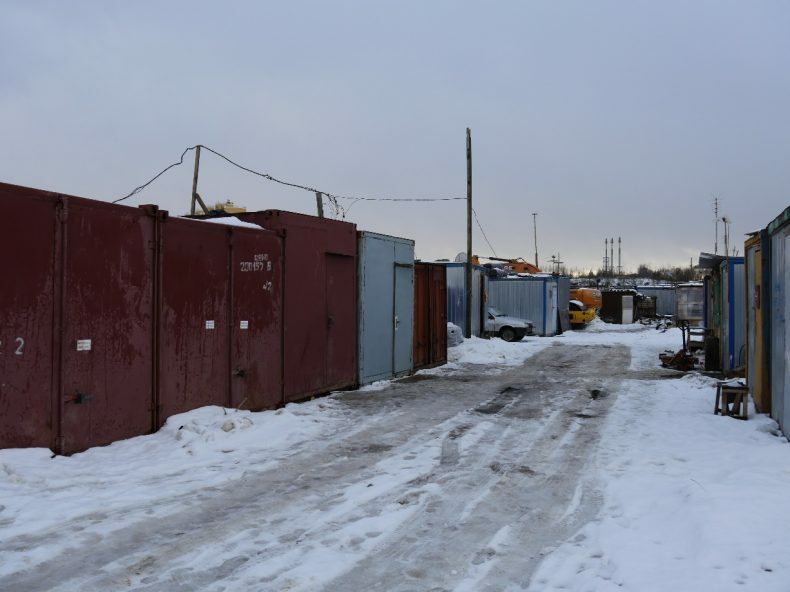 On a deserted building site in the suburbs of Moscow, dozens of containers are packed together. Inside one, a skinny teenager combs his hair while looking in a mirror attached to the container door. Not much larger than 4 by 6 meters, the container has four bunk beds, clothes hanging on the wall, and an old stove on the floor “for heating” says a cheerful boy sitting on his bed. Moscow, Russia – Labor migrants from Tajikistan in a container on a building site on the outskirts of Moscow. The container, where the migrants live, is shared with eight fellow countrymen. Image by Iris Oppelaar. 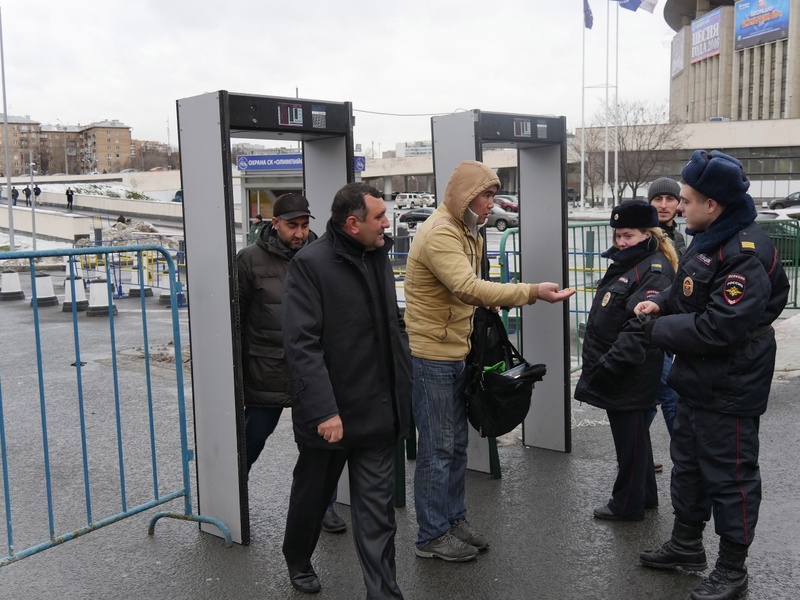 Unable or unwilling to return to their home country, migrants have to face Russia’s reality. A large number of (mostly uneducated) migrants live in illegal spheres, often with low-paid jobs and harsh living conditions, facing discrimination and harassment. Societal and state attitudes toward immigrants are of significant importance to the adaptation process. In Russia, the degree of suspicion and racism varies significantly toward different immigrant groups and their corresponding nationalities. The war in Chechnya, the War on Terror, and the metro and airport suicide bombings in Moscow have left their marks on Russian society. Immigrants, especially from the autonomous republics of the North Caucasus and from Central Asia, regularly face discrimination and harassment. In addition, the illegal status of immigrants makes them more vulnerable to discrimination, racism, corruption, and extortion. It also limits their opportunity to institutionalize religious immigrant organizations. Russia’s (often unofficial) policies and practices severely limit the space allowed for religious expression outside that which is state controlled. Moscow has four officially recognized mosques. Plans for new mosques have been opposed by the local population and the government. Moscow counts around 150 religious organizations, which are under tight government control and are headed under one of the four spiritual boards. Police, militia and security forces are prominent on the streets surrounding the Cathedral Mosque in Moscow. Bags are checked and all visitors searched before entering the mosque. Image by Iris Oppelaar. On a cold Friday morning in Moscow, thousands of Muslims, mostly immigrants from Central Asia, make their way to the Cathedral Mosque for Friday prayers. Streets around the mosque are closed off. Police, militia, and security forces are prominent. Bags are checked and all visitors searched. Lawyer Bakhrom Khamroev is sure that migrant workers are not recruited in one of four moderate and government controlled mosques in Moscow. “Those with an interest in radical Islam seek it elsewhere, outside of government control,” he says. Government control and limitations on the institutionalization of immigrant religious organizations push new immigrants to practice their religion in unofficial spheres. This phenomenon is not unknown to the Muslims of Central Asia, where Soviet atheist policies led to the emergence of “parallel” Islam, where people practiced their religion in private, in contrast to the state-controlled “official” Islam. This already ongoing practice of “parallel” Islam was enforced in July 2016, when Putin signed an anti-terrorism bill. Among other restrictive measures, the bill prohibits the practice of religion outside of recognized churches. The bill is perceived by many as just another tool for government agencies to crackdown on any form of uncontrolled practice of religion. Russian state’s government control and society’s fear of radical Islam has pushed some migrants to “underground” Islam, out of sight of the authorities, where they serve as easy targets for recruiters. Caught between repressive regimes and a lack of prospects in their home countries and discrimination and harsh living conditions in Russia, “The promise of a good life in the caliphate is attractive,” says lawyer Khamroev. 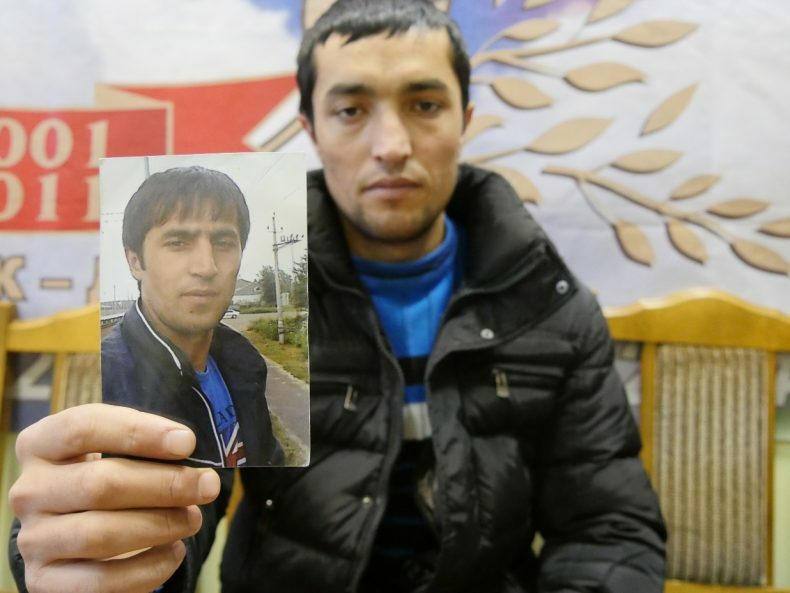 Moscow, Russia – A Tajik labor migrant holds up a picture of his brother, who has been missing for seven days. Image by Iris Oppelaar. Different recruitment methods can be distinguished, both in the migrants’ Central Asian home countries and in Russia. Besides the religious reasons to join Islamic State, there are economic incentives as well. Migrants are recruited when they are most vulnerable, often when in a financial bind. With promises of a better life and pay of $500 to $1,000 per day, Central Asian migrants are persuaded to fight for Islamic State. It is often assumed that Chechens play an important role in the recruitment of Central Asian labor migrants in Russia. “Migrants that haven’t been paid for months and are in deep financial problems turn to the mosque for prayers. It is at those vulnerable moments that a recruiter reaches out to help,” says an employee of a non-profit organization. Migrants often end up fighting for groups like the Islamic State under false pretenses of a good job or study in one of the neighboring countries, such as Turkey or Iran. In general, “befriending” recruiters play a vital role in the recruitment process. Clans and clan networks are, as they always have been, the prevailing social actor in Central Asia. These relationships through marriage, family alliances, neighborhood, or village affiliation are often tapped into when in Russia and in search for jobs, housing, and in times of need. Many villagers from Chorqisloq were also working and living together in Russia — and apparently recruited together to travel to Syria. With the weakening position of Islamic State, the fear of returning Islamic State fighters is the new reality for Russia and the Central Asian countries. Putin has openly expressed his concerns about Islamic State fighters returning to Russia. In the past, Russia has also worried about the growing threat of fighters from Islamic State who were supposedly planning attacks on Central Asian states to destabilize the region. It is in fact likely that people will try to return home from the caliphate. The question is whether the Central Asian states are prepared. The fieldwork for this article was carried out with the help of the Pascal Decroos Fund for Investigative Journalism. Iris Oppelaar is a researcher and photojournalist focused on Central Asia. 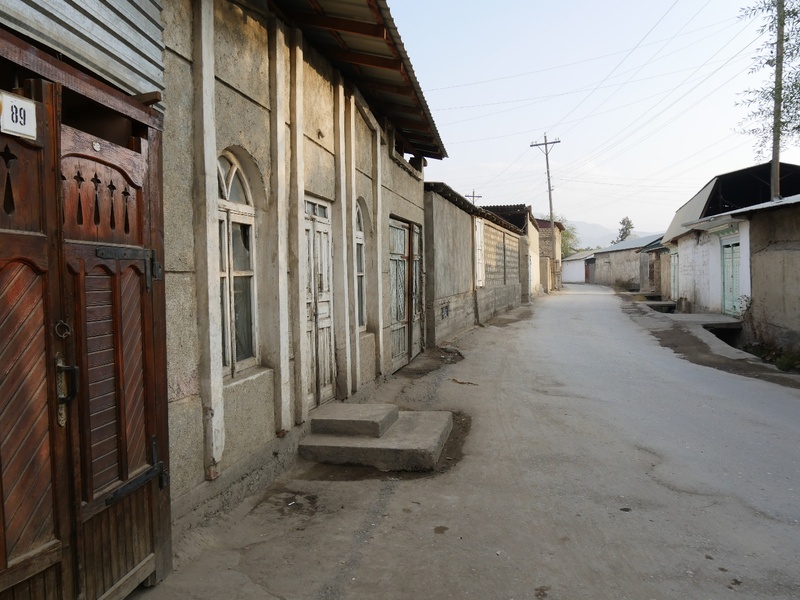 A family leaves home in Kyrgyzstan to join the Islamic State. Tragedy ensues. Tajik Asylum Seekers Struggle for a Sense of SecurityThe Kok Zhailau Problem and Kazakh Civil Society#FreeKhayrullo and the Art of Changing Tajikistan's MindJournalism in Kyrgyzstan: Shoot the Messenger?Does the UN Care About Human Rights in Central Asia?